A group of researchers reported the discovery of 42.6 million-year-old marine sediments along Peru’s coastal area. The discovery hints at an ancient four-legged whale which was the predecessor of today’s whales and dolphins. The new discovery sheds light on how these animals, also known as Cetaceans evolved through history. The findings of the study were reported in the journal Current Biology on April 4. Researchers focused on the existence of small hooves located at the tips of fingers and toes on the ancient four-legged whale. The construction suggests that it could walk on land while also living in the water, the discovery suggests. “This is the first indisputable record of a quadrupedal whale skeleton for the whole Pacific Ocean, probably the oldest for the Americas, and the most complete outside India and Pakistan,” Olivier Lambert of the Royal Belgian Institute of Natural Sciences said in a statement. Several years ago, the study’s co-author Mario Urbina of Museo de Historia Natural-UNMSM, Peru, discovered an area in the coastal desert of Southern Peru called Playa Media Luna which could be a promising site for unearthing fossils. “When digging around the outcropping bones, we quickly realized that this was the skeleton of a quadrupedal whale, with both forelimbs and hind limbs,” Lambert said. Using microfossils that they found, researchers successfully dated the sediment layers of the skeleton to the middle Eocene time period which took place around 42.6 million years ago. They took a careful look at the skeleton details of the animal, finding that it could easily maneuver its large body that could measure up to 13 feet long, through both water and land. A closer look at its tail, particularly the caudal vertebrae, showed that the animal had a tail similar to that of otters and beavers which was a great addition to its swimming capabilities. 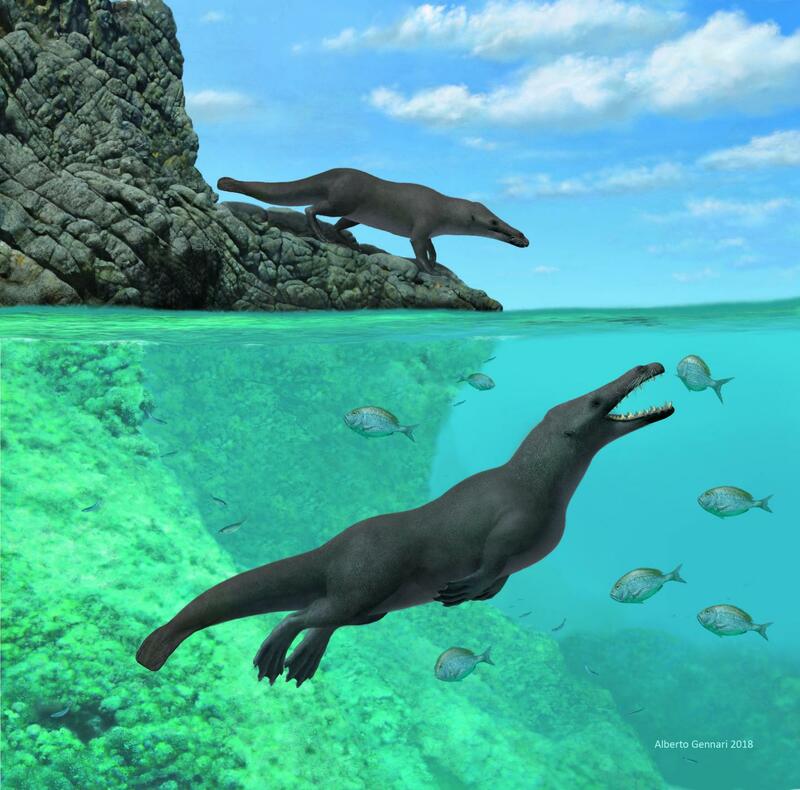 After discovering the geological age of the sediments, researchers were able to confirm that its discovery supports the theory that early cetaceans used the Atlantic Ocean to get to South America, starting their journey from Africa. The whales benefited from the westward surface currents, as well as the fact that the distance between the two continents was half compared to today. Researchers who participated in the study suggest that only through this way it was possible for modern whales’ and dolphins’ ancestors to eventually reach North America. The team, which consists of scientists from around the globe, will continue to focus on the sediments and study other whales and dolphins from Peru in order to connect the ancient animals to their modern counterparts. “We will keep searching in localities with layers as ancient, and even more ancient, than the ones of Playa Media Luna, so older amphibious cetaceans may be discovered in the future,” Lambert said.